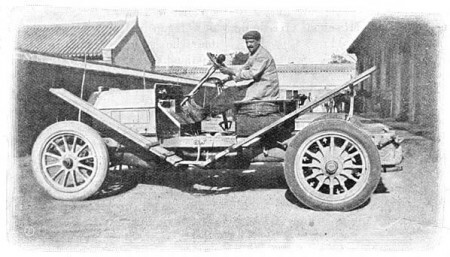 In an article in 1907 the french newspaper Le Matin challenged motorists to prove that the motorcar had a future. The challenge was to drive from Peking (Beijing) to Paris through areas where there were no proper roads and no maps. Many showed their interest but only 5 crews made it to the start from the French Embassy June 10. Among them was the Italian prince Scipione Borghese in his Itala. Two months later he drove into Paris as the winner. The price: a bottle of Mumm Champagne and the Glory! 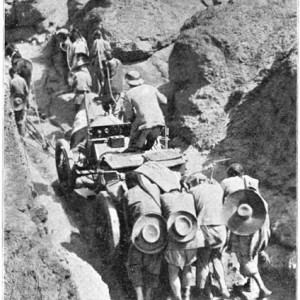 Fuel was transported to depots on camel back along the route which went in the same areas as the telegraph lines. Reporters could send regular reports home to their newspapers. Some stages of the route were so bad that the crews needed help from both men and horses to make it through. There were some bridges but they were not very safe. 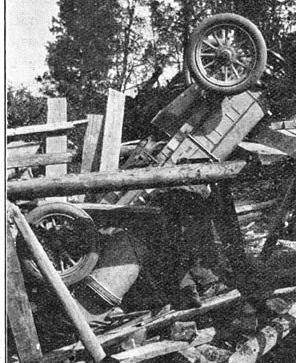 Here the Itala has gone through a bridge but it was safely returned to horisontal position to be able to make it the rest of the way to Paris. Phillip Young started his career as organizer of rally events by doing the Pirelli Classic Marathon from London to Italy and back in 1987. From there he went on to arrange numerous Monte Carlo Challenges and a lot of other classic and vintage car challenges. See www.endurorally.com. In 1997 he decided to copy the achievement of the long run having been made 90 years before. Enter the Peking to Paris 1997. There were to be another 10 years before the 100th anniversary and from then on it has been arranged every 3 years.